For any Vegan ‘foodie’, to hear about a vegan Italian restaurant is only to dream of……well, there is now one right in the heart of Dalston, East London! Fed By Water is a brand new Italian concept restaurant, offering authentic, traditional cuisine, with an Interesting and innovative menu. You can get anything from vegan garlic bread to cashew cheese balls & even pizzas with a hemp seed crust! You have a lot of choice! Staff give you a warm welcome and the restaurant has a nice feel. The prices are high, but it is gourmet food, without the usual tiny ‘gourmet’ sizes and I feel that the generous portions justify the higher end pricing. 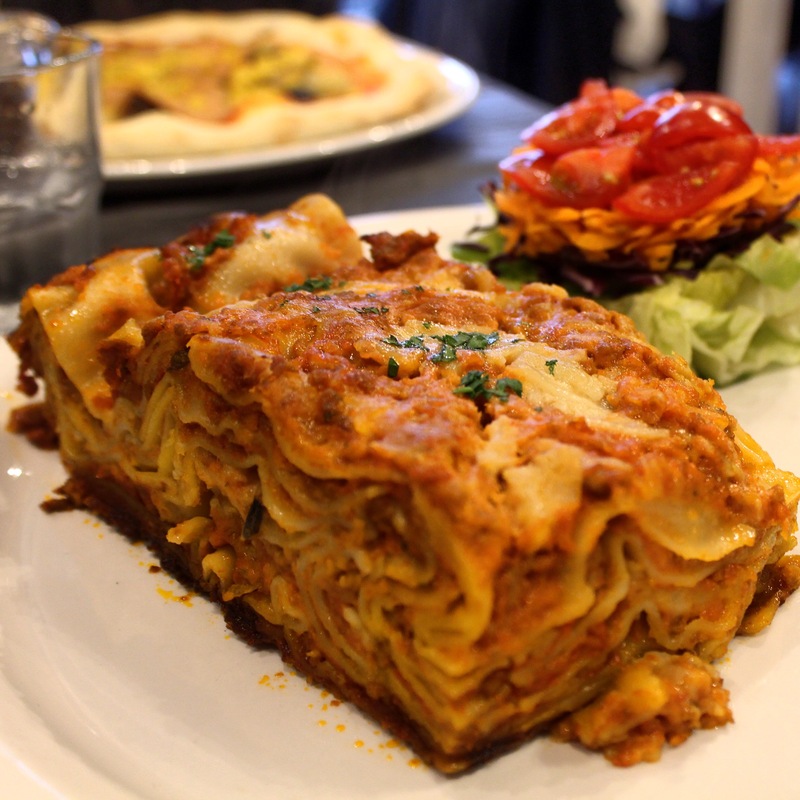 It was easily the most delicious vegan lasagne I’ve ever eaten! The sauce was intensely flavoured and you could very much tell a lot of thought had gone into this recipe. I wasn’t able to finish my Lasangne, so took the other half home in a take away box. The vegan Tiramisu again, was generous as well as very tasty. If you are like me and have a constant list of new Vegan restaurants to try put Fed on your list! I’ve been coming here since last summer, when the The Vegan Hippo opened & I’ve watched it grow from strength to strength and the menu develop and expand. It is one of my favourite vegan spots in Soho! The food is delicious. I’ve tried a few other places in London that serve jackfruit burgers, but their’s is by far the best I’ve tried yet. As a French fries lover, I was worried that the kale chips would not be filling enough for me, however they are the perfect accompaniment to the burger. You can pay a small amount extra an add a slice of vegan cheese! Do it! 🙂 The Polish Pierogi and the hot dog is great too. In addition, they also serve a large selection of take away salads and sandwiches. The restaurant is excellently located & very easy to find. I usually take the tube to Piccadilly Circus, then head out of exit one. It’s about a 4 minute walk from there, or it’s just as easy to get to from Oxford Circus.